Last month in Vietnam, rapper Hàng Lâm Trang Anh asked President Obama about the state of the arts in America, to which he replied that we don't censor artists, adding: "I truly believe if you try to suppress the arts, then I think you're suppressing the deepest dreams and aspirations of a people." Indeed, less than a week later, it appeared that the Smithsonian Institution's Asian Pacific American Center (APAC) had lived up to this sentiment when it hosted Crosslines: A Culture Lab on Intersectionality on Memorial Day weekend in Washington D.C. in the Smithsonian's 136-year-old Arts and Industries building. It was an appropriate venue for an art show which represented a historic moment for the national institution through its willingness to engage topics of racism, sexism, colonization and religious discrimination by having 40 artists from America's most politically and socially marginalized groups tell their own stories in their own way. "We wanted to find ways we could meet our audiences and give them a transformative experience they could really interact with and at the same time challenge them," said APAC's Curator of Digital and Emerging Media Adriel Luis. "When it comes to people of color, visibility in the media and arts can be considered a political topic, itself." The show that APAC had conceived was timely, necessary and aligned with national ideals of free speech and equal representation for all. Of course, all but the most privileged among us know that this country rarely lives up to that standard, but APAC and the artists it invited to participate in Crosslines maintained hope that this event would be an exception, a place where the public could catch a glimpse of a world without discrimination and silencing. But thanks to recommendations in a 2011 Smithsonian report by an ad hoc advisory panel which called for greater preparation of exhibits it deigned "culturally sensitive," the reality fell short of that hope and exposed the Smithsonian's willingness to censor the voices of those who are rarely heard yet equally deserving of a national platform. Two such voices were those of Gregg Deal and Anida Yoeu Ali. Both artists had been approached by APAC to participate in the Crosslines exhibit and both accepted, eager to engage the public and start conversations that were aligned with the Smithsonian's own mission to spark "lively discussion and debate of relevant intellectual and social issues." When they outlined their respective exhibits, the staff at APAC were supportive, but in order for either artist to display their work, their proposals also needed to be vetted and approved by the larger Smithsonian Institution, itself. Thus began a curious back-and-forth between the artists and the broader institution which made demands without explanation and without ever engaging the artists directly. For Deal, an Indigenous artist belonging to the Pyramid Lake Paiute nation, the Office of Public Affairs expressed concern that he might mention The Washington Redskins in his work, indicating that his stance would be too politically charged. Though he had not mentioned anything about the team in his concept, the preemptive mention of the name as a "no-go" was troubling. "As an artist my work is about my Indigenous experience and here they're telling me I can't do something (about that experience)," said Deal, a former Washington D.C. resident. "When they're not allowing a Native American to use the term "redskins" that effort is itself a political statement, so it gets pretty ironic pretty fast." Stranger still was the Smithsonian's insistence that Deal's work be submitted for additional approval by Kevin Gover, director of The National Museum of the American Indian. "I was like, well if I have to check my art work through the American Indian museum, do the black artists have to go through the black history museum, do white artists have to go through the American history museum?" said Deal. "So there was this cultural policing that was happening...they don't represent me, I'm just the artist and this is my voice. Are they the gateway for all things Indigenous?" When asked for the reasoning behind this request, Smithsonian Spokesman and Press Secretary John Gibbons acknowledged that Gover was consulted "to make sure (the work) was appropriate." "Because of the sensitivity of the Native American community we wanted to make sure we were doing the right thing as well," he added. He was unable to comment on why Crosslines' one Indigenous American artist was the only person singled out for this type of ethnic and political approval. The impact of this left Deal feeling dehumanized within the context of his own work. "It kind of felt like when you're in a store and somebody starts following you," Deal said. "In that moment, you immediately question yourself as to whether you've done something suspicious or wrong, which is ridiculous. When I was able to assess that I wasn't at fault and was carrying the same integrity of my work, it was frankly depressing. I was frustrated and nervous, because as an artist you work for these types of opportunities." Gibbons was unable to comment further on any specific artist or member of the Smithsonian's vetting panel, but for Ali, a Muslim American artist of Cham Cambodian heritage, this voluntary silence mirrored that which was imposed upon her both figuratively and literally. Much of Ali's work revolves around hate crimes and gender representations and is performed while she is dressed as a character known as The Red Chador, a fully veiled woman clad in a heavily sequined, ruby red version of the chador, one of the many garments worn by Muslim women throughout the world. In 2015, just months after the attacks on Charlie Hebdo in Paris, Ali was invited to the city's Palais de Tokyo to perform the "Red Chador Beheadings" in which she surrounded herself with 99 baguettes and made impossible and absurd demands upon the public which had to be met within an hour lest she "behead" the baguettes, one by one. "No one had a problem with that performance, everything was fine, and everyone from the curators on supported it," said Ali, who is also a professor at Trinity College in Connecticut. Through the use of humor, the work provoked the Parisians to examine media portrayals of religious violence, its own history as a colonizer of Cambodia and the ongoing "othering" of immigrants and Muslim peoples. And while it might seem surprising that a French institution would welcome such art in the wake of the massacre, the outcome was one of connection rather than division. "People really engaged with me, they came, talked and tried to defend, tried to save, tried to do everything they could in that one hour," Ali said. "Every time a baguette was saved the room would erupt in applause and when it wasn't, when I chopped one, everyone was gasping." Ali's experience in Paris stands in stark contrast to the level of resistance that her proposal for Crosslines faced from the Smithsonian. Given the rise of Islamophobia and the nature of the weekend, itself, Ali felt the time was right for The Red Chador to start a conversation about the nature of being both Muslim and American. So, her first concept involved the use of 99 American flags painted white and featuring the word "salam" - which is Arabic for peace - painted on them. "It's talking about the Muslim identity and the American identity being a kind of palimpsest that cannot be fully erased," she said. "To me it was very poetic, it was never about anything that was going to be a defacement or a disgrace." Though APAC remained supportive throughout, Ali's concepts were repeatedly denied by the Smithsonian's officials. 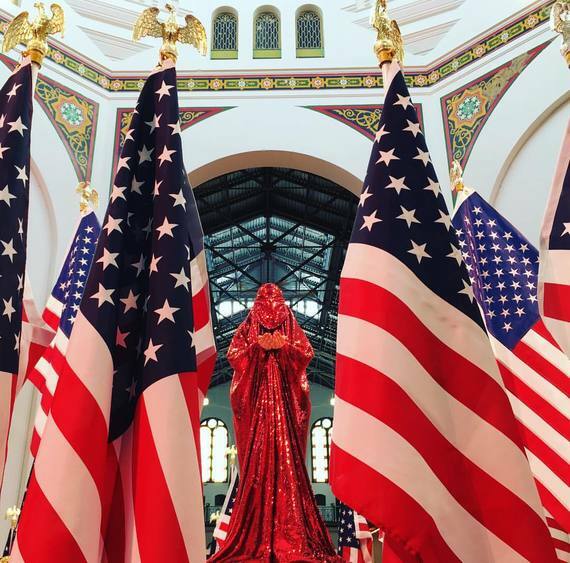 One concept included The Red Chador respectfully inverting and reverting unpainted flags as a sign of distress, in another, The Red Chador did nothing except read passages from the Bible until she was exhausted. None passed muster. "At that point I was like: 'now it' ridiculous, is it that they don't want The Red Chador?'" Ali said. "So the final idea was to test if The Red Chador herself could simply exist." Thus Ali's fourth and final proposal consisted solely of The Red Chador standing silently upon a podium surrounded by American flags. The concept was approved on the condition that she sign a contract stating she would do nothing more than stand in silence, with the implication that any deviation would put jobs on the line. Though he did not comment on any specific element of the demands or decisions made by the Smithsonian, Gibbons maintained that everything that took place between the institution, Deal and Ali was all part of the normal curatorial process. "There's a give and take between the curators of the show and the artists," he said. "It isn't censorship, it is a constant dialogue to ensure we get to the place where we can support the show as the Smithsonian and can support them as an artist. By signing the contract, it shows they've come to an agreement with us." However, when people agree to sign a contract it doesn't mean that it is inherently fair or that the interest of one of the parties isn't unduly suppressed when the only other option is to relinquish an opportunity outright. As a public institution, the Smithsonian sets the terms: "agree to our demands or we remove your national platform." While it's understandable that a national institution would not agree to showcase works which take a partisan stance or marginalize any group based upon race, gender, religion or orientation, its ethical integrity suffers when opaque committees filter down unexplained and seemingly arbitrary demands which police the voices of artists who are simply asking that their perspective be considered. They make no political demands; they do not threaten or insult others, they simply speak directly to the all-American experience of being a Muslim in a place where presidential candidates preach the gospel of Islamophobia or of being an Indigenous person in a country where sports teams use racial slurs as names and where history books never suggest genocide. It is these voices that are among those Americans most need and deserve to hear. The curators at APAC understood this as did the thousands who came to witness Crosslines. Because of the effort of APAC and the positive response from the public, Ali and Deal were ultimately pleased with the outcome of their exhibits despite the limitations placed upon them, seeing the event as a jumping off point for something greater. They contend that a fair and equitable society is one which fearlessly engages in tough conversations with those long-silenced and challenges the notion that simply being a person of color, or a woman, or a Muslim, or a member of the LGBTQ community with experiences and opinions is somehow inherently threatening or invalid. This insidious belief, apparently held by some in the upper echelons of the Smithsonian Institution, is the very embodiment of systemic prejudice and marginalization. I'd like to believe that we, as a nation, can do much better.